The AKC Gazette published an article by Dr. Jerold Bell regarding breeding practices. Their permission has been granted to publish a link to the article on the AMCA website. You can find the article here: http://clubs.akc.org/wtca/health/health_bell_4.pdf Recently, the following articles were printed in ShowSight Magazine. Their permission has been granted to publish the articles on the AMCA website. Thank you to Sharon Weston, Robin Haggard, and Jim Kuehl for their work on these articles!!! Originally written by Sharon Weston, AMCA JE Coordinator for the January 2013 edition of ShowSight magazine. Permission has been given to reprint on this website. This is a test…close your eyes; someone says Alaskan Malamute. What do you see; power, substance, athletic, beauty? That’s a good start! Our breed standard is a simple one spelling out what makes the “ideal” Malamute. We don’t use a lot of fancy words that send you to Spira to find out what we mean. You don’t need a degree in geometry because we don’t use a lot of numbers or percentages to describe how the breed should be made. There is only one disqualification…Blue eyes. However, because the Malamute is a natural breed there is a range of variety that is often confusing to judges. We are going to explore these areas. There are 3 words I share with people to help them put the standard into perspective. TYPE is the first and most important. To have breed type there can be no question the dog looks like a Malamute; not a Siberian, not an Akita. Next the dog must possess all the physical attributes necessary to do its work. The combination results in breed type. Second and very important is BALANCE. This breed is not extreme. All parts must blend together so that no part overtakes all others. The third word is STYLE. When Malamutes walk into a ring you may think they all look like a Malamute but they can look quite different from each other. That’s where style comes in. It’s the look! It can be face markings, coloring, size to some degree, coat length, etc. In order to understand the reasoning behind our standard one must remember what the breed was bred for. The Malamute is the powerhouse of sledge dogs. His job is to haul a heavy load over a long distance at a moderate speed unlike the Siberian who hauls a light load. He is asked to do this under the most extreme conditions and often on a very limited diet. The Standard refers to moderate several times; therefore, extremes are not in keeping with the ideal Alaskan Malamute. With this in mind how do we find the best exhibit before us on any given day? Please CLICK HERE to read the rest of the article!!! The Alaskan malamute is the heavy freighting dog of the north. 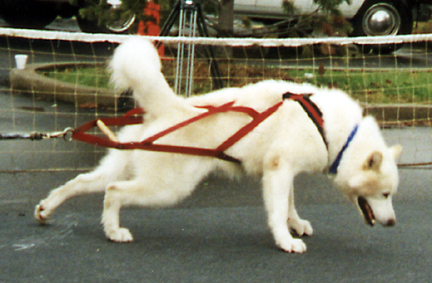 Malamutes pull heavy loads at slow speeds. They are not racing dogs. 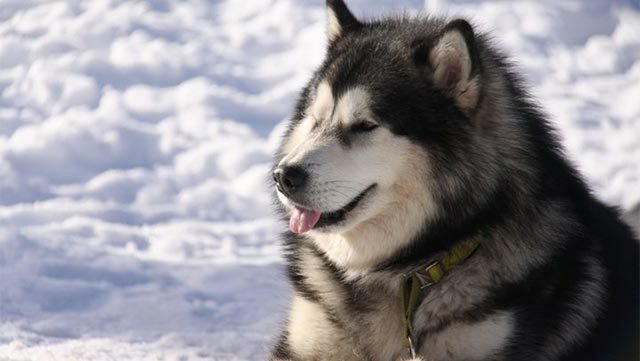 The Malamute’s breed characteristics developed from the harsh environment they endured as much as from the lifestyle of the Inuit, the people of the North American Arctic coasts. These Arctic dogs were a necessity for Inuit survival. The dogs not only pulled sledges, they carried backpacks in the summer, they located seal breathing holes in the coastal ice, and they distracted Polar bears for hunters. The Inuit are one culture from the coastal areas ofAlaskatoGreenland. Their dogs are essentially one breed across that large geographic area. Differences in these dogs that we see today, such as length of leg or coat, color and markings result from the geographical separations of these nomadic people. 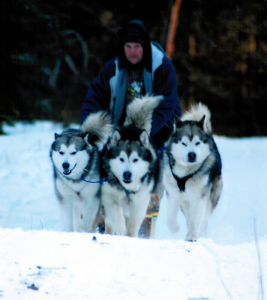 The dogs Robert Peary used in the 1890’s to explore theArcticcould compete in our show rings today. 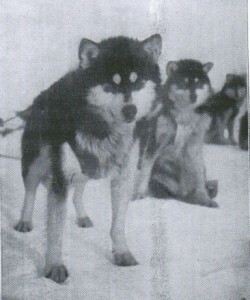 There are still dogs used by the Inuit inGreenlandthat are true to Malamute type. The Malamute gene pool today is made up of three basic strains. TheAKCrecognized the original Kotzebue strain, registered in 1935. 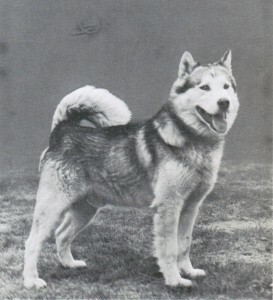 The AKC opened the Malamute Studbook and admitted the M’Loot and Hinman strains in the late 40’s and early 50’s. 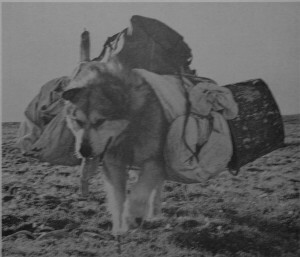 The Army had drafted most sled dogs for service during World War II. In accordance with US military protocol, the Army destroyed most of those dogs at the end of the war, so that there were too few registered dogs to maintain the breed. The Malamute Club modified the original 1935 standard in 1960 to accommodate the new bloodlines. This change in the standard and admission of new lines caused a great deal of strife in our Club over the years. The one dog that unites all of these lines is Ch Toro of Bras Coupe. He represented our breed for many years in the “AKCComplete Dog Book.” Toro is behind every Malamute alive today because of his use in blending all three Malamute strains. He was owned by Earl and Natalie Norris of Alaska and won the Breed at Westminsterin 1952. Please CLICK HERE to read the rest of the article!! !